If you’ve always liked the vibe of Lowden’s O-shape acoustics, but are looking for a more compact instrument, an F model may just prove to be the perfect fit instead. It’s widely, but incorrectly, assumed that Lowden’s F model designation stands for ‘folk’. 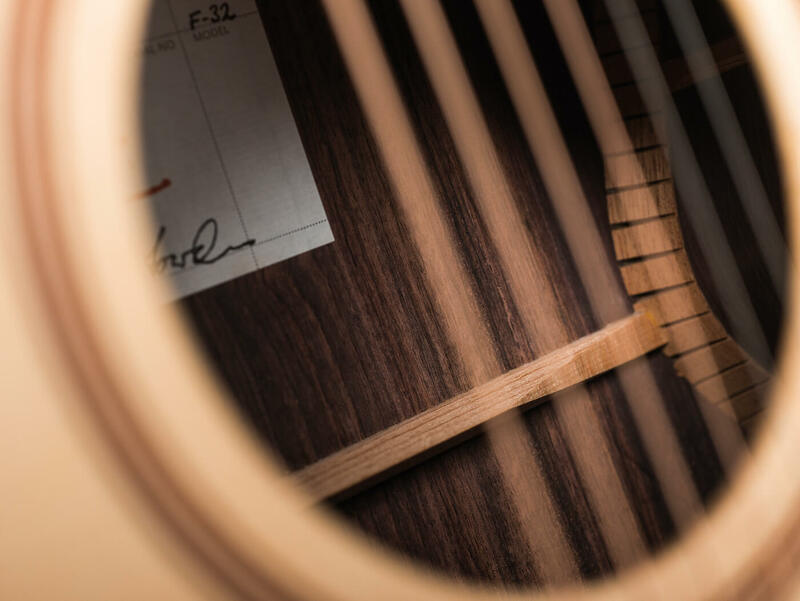 As it turns out, F refers to ‘flatpicking’, but the model’s all-round capability and how this is achieved reveals a lot about Lowden’s approach to design. In essence, the company uses A-form bracing across the product range, but the braces are voiced depending on the dimensions of the bodies. 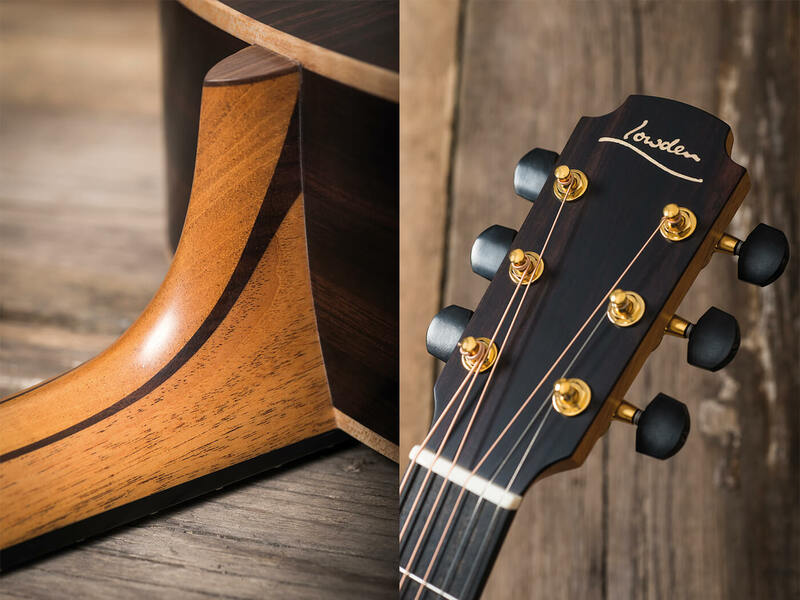 So, the O models have treble-biased bracing to balance the high frequencies with the naturally powerful bass response of Lowden’s largest body style. At the other end of the spectrum, the Wee Lowdens have bass-bias bracing to achieve the opposite. Lowden describes the F models as small jumbos. The body dimensions allow for a more even frequency response, so flat-bias bracing ensures no frequency band is unduly dominant or weak. 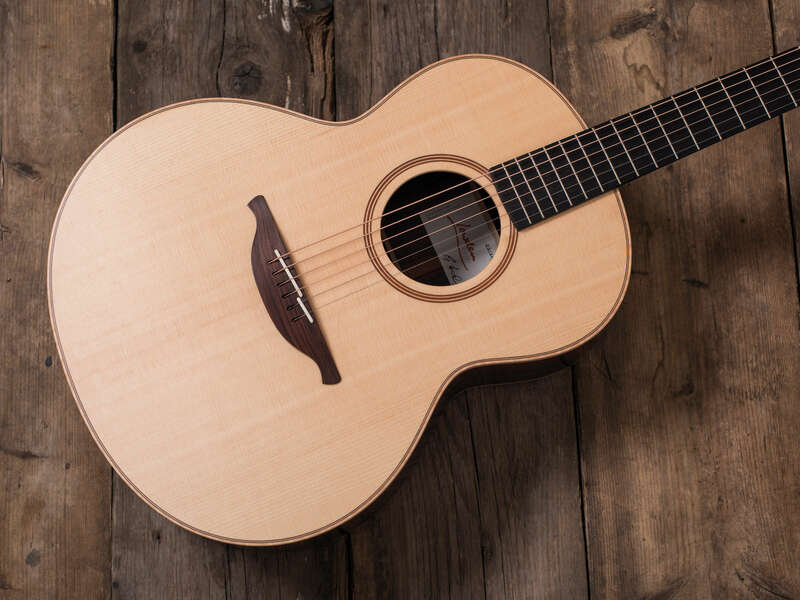 The F models have been popular since their release in 1982 and tweaked in 2003 with a smaller soundhole for extra projection and focus, and this F32 sits at the top of the range. It combines a Sitka spruce top with rosewood back and sides and as usual, we see a five-piece neck of laminated mahogany and rosewood, with an ebony ’board and a top-loading rosewood bridge. The binding is figured sycamore, with mahogany, walnut, sycamore and rosewood for the purfling and rosette. Having encountered several Lowdens of late, we’re struck by the sheer consistency in build quality and playability. The key construction methods, fine details and feel are unmistakably and uniquely Lowden. This writer owned a ‘blue label’ 1979 Lowden L32 for several years, with similar tone-timber specs as this smaller-bodied F32. Despite the size and shape differences, thecrisp, ultra-clean treble, combined with remarkable bass extension, are immediately familiar. However, this new F32 sounds better and plays more easily than the one that got away. For instance, despite having been well played for over two decades, the old L32 never felt as responsive and freed up as this F32. Maybe the bracing had to be a little stiffer to support the L32’s larger soundboard, but by our reckoning, the F32 more than holds its own in the bass. Many appreciate the darker midrange woodiness of Gibson-style acoustics and the more delicately open qualities of certain Martin designs, but there’s nothing particularly ‘American’ about the F32’s tone. In terms of frequency range and definition, the F32 compares to certain classic acoustics in much the same way high-end hi-fi systems compare to computer monitors with an added subwoofer. The phrase ‘harp-like’ seems more apt than ‘piano-like’; the F32 has a mysterious and ambient quality. The tone is drenched in harmonics that linger on inside the body like a tuned natural reverb. Starting with strummed chords, the plain strings produce a pseudo 12-string effect and a low-mid thump helps to propel rhythm parts. Each string has equal prominence, almost as if an ultra-high-end studio compressor has been applied. Chord inversions and embellishments come through clearly and no part of the frequency range dominates or is overpowered. The F32 is just as well suited to fingerpicking duties, where the inherent balance and even response make this a very easy guitar to play. Lowden is up there with a select few makers in producing guitars that actually make a player’s technique sound better and more accurate than it really is. The string spacing may be helping here, with a fairly standard 54.5mm at the bridge, but a slightly wider-than-usual 37.5mm at the nut. The fretboard width is ample for the string spacing and there’s never any danger of strings slipping over the edge. We delve down into DADGAD and it’s as though the F32’s sound gets even bigger. The airy trebles remain, but the low end begins to emit a throaty growl while retaining tautness and definition. With the low D acting as a drone string, combinations of open and fretted notes on the upper strings have an almost hypnotic effect. One test we regularly apply to acoustics is to gauge how the tone alters depending on where you pluck the strings. With Lowdens in general, and this guitar in particular, strumming at the end of the fretboard, across the bridge-side-edge of the soundhole and adjacent to the bridge itself produces three very distinct sounds. With this much tonal range to exploit, the F32 is a very expressive guitar indeed. 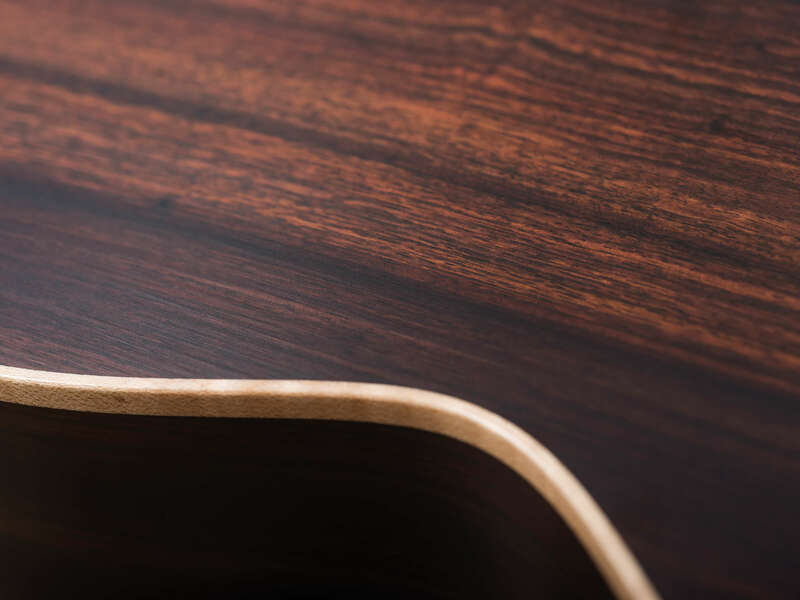 Whether it’s the fresh Sitka spruce, the rosewood or a combination of both, the treble has more crystalline quality than the cedar and redwood models we’ve reviewed of late. Even so, it’s never brash or metallic, even with brand-new strings and it’s an excellent alternative to Lowden’s woodier and warmer cedar-topped models. Looking at the string height side-on, we were initially concerned the F32 might be a tad challenging to play. These fears are instantly dispelled and the easy action – and we suspect the crisp and clear notes – can be attributed to the extreme precision of the fretwork and nut slots. This also pays dividends with outstandingly in-tune open chords, and Lowden’s split saddle also keeps everything sweet wherever you happen to be playing along the glass-smooth ebony fretboard. Lowden acoustics are never cheap, but in our experience, they never disappoint – and this is yet another outstanding guitar that’s worth every penny.